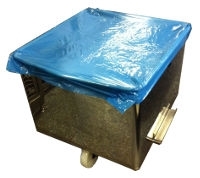 Europ tank cover, in detectable blue polyethylene. Food safe. Thickness : 38 microns. Colour : blue. Packed by 250 covers roll. Fits our stainless steel Europ tanks (200 or 300 liters) or our polyethylene Europ tanks (185 or 200 liters).